There was a time about 30 years ago when this particular astrologer felt there was a fair chance that the end was nigh. It does seem hard to believe now looking back to 1983 but many felt that some kind of superpower nuclear confrontation was inevitable. The Cold War between the Soviet Union and the West had been gradually increasing since the 1950s and there had been incidents before when we seemed to be on the brink of World War 3, not least during the Cuba Missile Crisis of the early 1960s but tensions were rachetted up significantly in the early 80s by a number of factors. American presidents and other leading western politicians of the 1970s whilst keen to stand their ground against the Soviets, were also interested in exploring avenues for detente. This changed significantly with the election of Ronald Reagan and Margaret Thatcher in 1980 and 79. Four years prior to becoming president, Ronald Reagan stated, “My idea of American policy toward the Soviet Union is simple, and some would say simplistic… It is this: We win and they lose. What do you think of that?” Both Reagan and Thatcher denounced the Soviet Union and its ideology. Reagan labeled the Soviet Union an “evil empire” and predicted that Communism would be left on the “ash heap of history”. It would be useful to have a look at a few charts. Every country has a birth chart as well as individual people. This one is constructed for the moment that Lenin’s Bolsheviks took power during the 1917 Revolution. This chart has been discussed previously in a piece about Karl Marx but there are certain important factors that we should note here. For a government set up by a workers revolution it is very appropriate that the chart has the Moon and Ascendant conjunct in Virgo ( the sign of the workers ). The chart has a T Square that sets the tone very well. It is based on an opposition between the radically socialist Uranus in Aquarius and the controlling, repressive and authoritarian Saturn in Leo. What better way to describe the dictatorship of the proletariat. The tensions endemic between these two opposite planets focused by T Square onto an apex Sun in Scorpio. Whenever the Sun is at the apex of a T Square it signifies an extremely dominant and strong personality that has single minded resolve to pursue its own direction very strongly. Scorpio is one of the 4 Fixed signs and they all have tremendous stubbornness and determination and the middle ( around 15 degrees ) of the Fixed signs are supposed to be the most entrenched. Everything that has ever been said about the Soviet Empire can comfortably be contained in the symbolism of this aspect pattern. The important thing for this piece is to note that the Soviet Sun is at 16 degrees Scorpio. Ronald Reagan also had a T Square based on an opposition from his Moon to Jupiter. The apex of this pattern was also the Sun in a Fixed sign, in this case Aquarius. The US Presidents of the 70s had their Suns in Capricorn ( Richard Nixon ), Cancer ( Gerald Ford ) and Libra ( Jimmy Carter ). Both Nixon and Ford had their Suns in fluid sextile ( 60 degree ) aspect to the Soviet Sun and whilst Carter’s was not in aspect it was not hostile either. 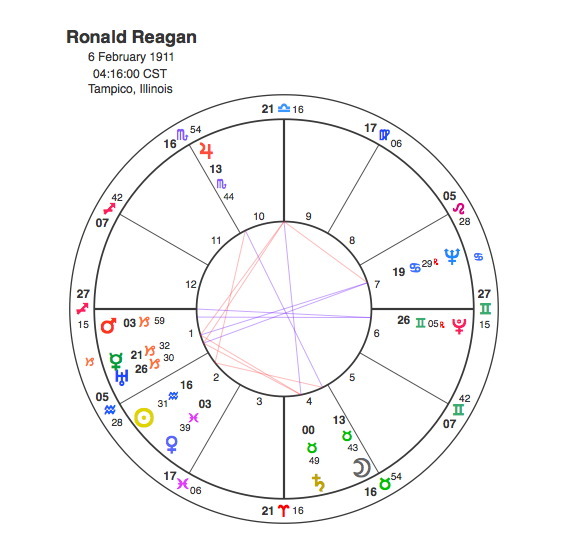 Reagan’s Sun is in exact square aspect to the Soviet Sun and he is pulling very powerfully in a different ideological direction and the conflict of this square aspect was visible throughout the world. 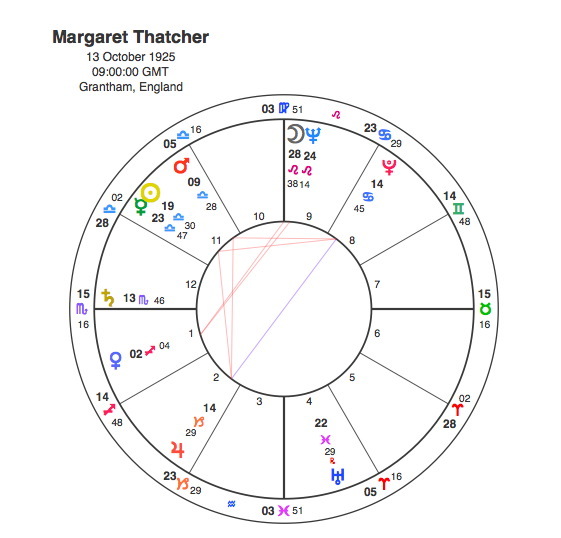 Margaret Thatcher also had a T square with an apex Sun and whilst this wasn’t in aspect with the Soviet Sun, she had a dominant and powerful direction all of her own. Her Ascendant however is exactly conjunct the Soviet Sun. In itself that would not be anything to worry about but Saturn is rising in her chart and therefore also part of the pattern. Many people comment these days that politicians are all the same, middle of the road pragmatists who talk a kind of anodyne PC nonsense and do nothing of any consequence. Having lived through the Reagan / Thatcher era, Capricorn Research believes we should be careful what we wish for. 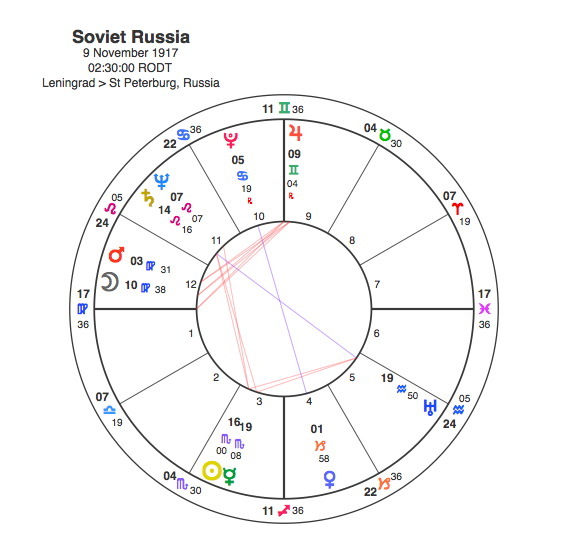 From the other side of the fence, the birth times for the Soviet leaders of this era are not available so we have to use noon charts but they all have interesting similarities. Pluto, as the ruler of the Soviet Sun sign Scorpio, had a powerful influence throughout the history of the regime and it played a dominant role in the charts of its leaders. 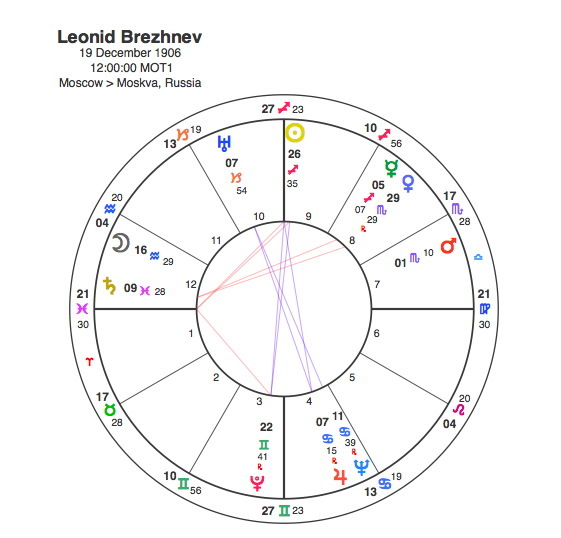 Leonid Brezhnev who had been the General Secretary of the Communist Party and leader of the Soviet Union since 1964 had the Sun opposite Pluto. The prevailing mood of the Soviet leadership at the time of Brezhnev’s death in 1982 was one of aversion to change. But at least Brezhnev’s tenure contained a strong degree of stability. That all changed with his death which is very interesting as it was Neptune, the planet of uncertainty and destabilisation that was conjunct Brezhnev’s Sun in 1982. It was as if this transit was a description not only of the end of Brezhnev’s life but also of the end of stable conditions in Soviet Russia. Brezhnev’s replacement was Yuri Andropov. Andropov had the Sun in conjunction with Pluto with the added bonus of Saturn for good measure. This is a seriously threatening combination and Andropov’s time as Soviet leader marked a significant deterioration of relations with the United States. In terms of missile deployments, the Soviet side was not interested in compromise, instead calculating that peace movements in the West would force the Americans to capitulate. The Soviet-U.S. arms control talks on intermediate-range nuclear weapons in Europe were suspended by the Soviet Union in November 1983 and by the end of 1983, the Soviets had broken off all arms control negotiations. It was the transit of Neptune that accounted for the death of Brezhnev and the uncertainty that followed. Bizarrely Neptune was opposite Andropov’s Sun /Pluto conjunction from 1981 until 1984 adding to the sense of uncertainty and confusion. 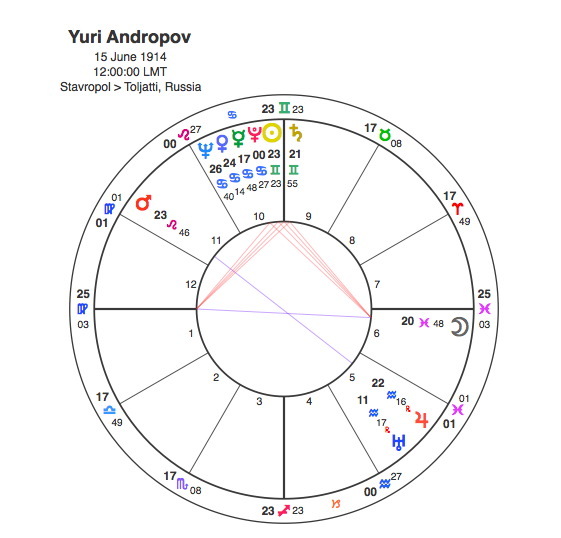 This was magnified by the fact that Andropov had the Moon in Pisces in square to his Sun / Saturn / Pluto. There was much uncertainty around the leadership as in February 1983, Andropov suffered total renal failure. In the summer, he entered a hospital where he would spend the remainder of his life. His aides would take turns visiting him with important matters and paperwork. He died in February 1984. The man elected to replace Andropov was another elderly figure, Konstantin Chernenko, who became leader despite concerns over his own ailing health. 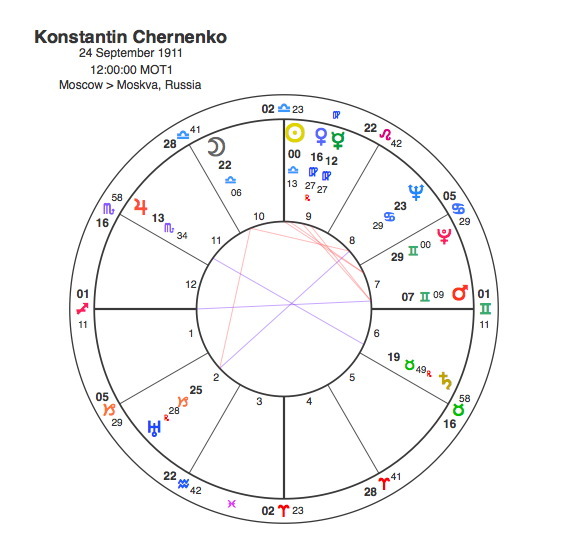 Its hard to believe but Chernenko also had a very close Sun / Pluto aspect, this time a difficult square. Chernenko did little to prevent the escalation of the Cold War with the United States. Its unbelievable but entirely appropriate that the whole of Chernenko’s short time in power coincided with Neptune being square to his Sun. In the spring of 1984, Chernenko was hospitalised and just like his predecessor died within a year in March 1985. The whole period from Brezhnev’s death was full of frightening uncertainty. Everyone wondered who was really running things and the whole situation felt like we were on the edge of a precipice. For once a knowledge of Astrology really didn’t help, to witness all this tension and unpredictability in the charts of the major players on both sides made things worse and there was one really scary astrological fact looming on the horizon. In 1989 to 90, Pluto would be conjunct the Soviet Sun, a transit that seemed to point only one way during those dark days of 1983 – 4, to nuclear Armageddon. Capricorn Research was seriously worried. Thankfully as it turned out, the scenario was quite different. Pluto had its explosive revolutionary impact but it was not nuclear war, it was the sudden and completely unexpected break up of the Soviet Union. This was mostly down to one man, Mikhail Gorbachev who succeeded Chernenko in 1985. Gorbachev has the Sun in Pisces, it is also opposite Neptune, which makes him doubly Piscean. Pisces is a Mutable sign. The whole purpose of Mutable signs is to break up the conditions that have become too crystallised in the previous Fixed sign. Pisces is the most fluid of all the signs because it is the last sign and its role in the circle of the Zodiac is to break up and disperse everything in order to create the conditions possible for a fresh start when the new cycle begins in Aries. When a Pisces Sun is opposite Neptune, this dissolution gets taken to its logical end. 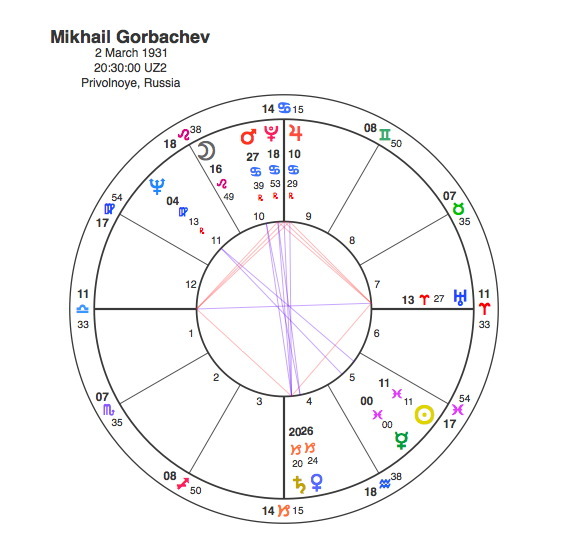 The Soviet chart with its T Square right in the middle of the Fixed signs was the most rigid of all political systems yet Gorbachev’s leadership oversaw a profound change. Words like perestroika and glasnost became familiar to the West. Perestroika means restructuring and was introduced in an attempt to overcome economic stagnation by accelerating economic and social progress. Glasnost gave the Soviet people freedoms that they had never previously known, including greater freedom of speech. The press became far less controlled, and thousands of political prisoners and many dissidents were released. Mikhail Gorbachev even introduced elections to the Soviet Union and in 1989 became the elected head of state. By now however, Pluto’s transit by conjunction to the Soviet Sun was taking effect and change was occurring at an incredible pace in the Soviet satellite states. The single event that defined the end of Soviet Communism was the fall of the Berlin Wall in November 1989 with Pluto exactly on the Soviet Sun. By the time the transit ended in 1991, the Soviet Union was no more. All those fears about the Pluto transit were in vain. The one thing you can be sure of with a Pluto / Sun transit is the unexpected, and the revolution was total, it destroyed everything that had gone before sweeping away the old system completely for a new world order to begin. This transit was like an atomic explosion in its transformation but fortunately no nuclear weapons were engaged. It was a Pluto revolution but the ground had been prepared by Gorbachev’s Neptune chipping away and eroding the foundations underneath the monolithic Soviet structure. Capricorn Research had not predicted it but there was one person who had over 10 years previously. Helene Carrere d’ Encausse, a historian who specialized in Russian history predicted the dissolution of the Soviet Union in her book L’Empire éclaté published in 1978. Her chart is extraordinary and a powerful witness to her prediction. She has a Sun / Moon / Pluto conjunction in Cancer in the 7th house. 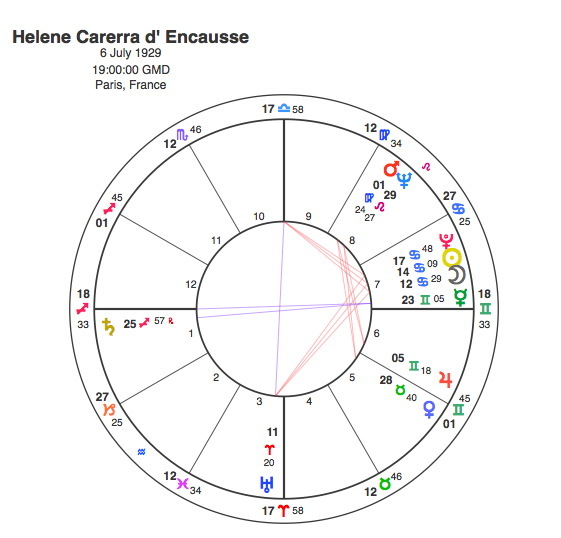 This in itself is a witness of a revolution ( Sun, Moon, Pluto ) in a country with a strong traditional base that she studied the history of ( Cancer ) who was an enemy of her own state ( the 7th house in political charts governs the enemy ). The staggering thing was when the book came out in 1978, Pluto was transiting square to her Sun, marking the biggest turning point in her life and predicting the watershed of the Soviet Union. Granted it was made before Thatcher and Reagan came along to crank up the pressure between the two superpowers but Helen’s prediction for the future was certainly more accurate than Capricorn Research. But with the Sun and Moon in close conjunction with Pluto, she obviously had insider knowledge.